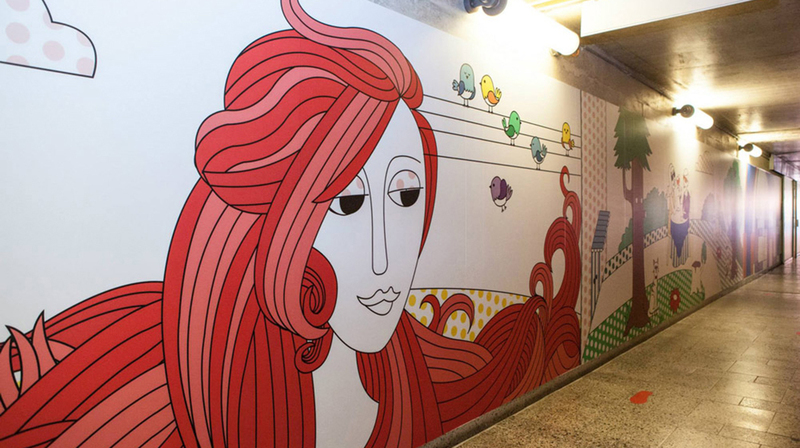 The Valletta 2018 Foundation inaugurated the Valletta Cruise Port tunnel, clad in illustrations by MCAST Art and Design students, following a project that spanned over a number of months. Valletta 2018 Foundation Chairman Jason Micallef said: “A group of 40 students reading for a BA Hons. Degree in Graphic Design and Interactive Media visually interpreted contemporary cultural expression in Malta, in the form of a journey through the tunnel. These illustrations mark the next few years leading up to Valletta 2018 European Capital of Culture and will be enjoyed by thousands of visitors in the months and years to come”. The tunnel at the Forni terminal is the area through which cruise liner passengers pass on arriving in Malta and the finished product is an example of high quality contemporary design. On the basis of group work, the students developed complete designs to cover the length, height and width of this tunnel. The design of a group of five students; Michela Mifsud, Desiree Dimech, Rebecca Barry, Silvio Micallef and Fleur Sciortino was eventually selected as it best fit the terminal’s purpose. This is not the first collaborative project between the Valletta 2018 Foundation and MCAST. The link with the Institute of Art and Design in particular has grown stronger over the past months following the students’ 3D projections (architectural mapping) on The Palace façade at Christmas time last year. This project was perhaps the most visible aspect of this collaboration and will again take place this year. The Minister for Justice, Culture and Local Government, Owen Bonnici, noted that by means of a creative and innovative project, MCAST degree students had a unique opportunity to put their talents into practice, while acquiring necessary skills for the labour market. The project is the result of synergy between a government entity, the private sector and MCAST. He described this work as one in a series of steps to brighten up strategic places while economic regeneration in Valletta and other towns and villages takes place. Valletta Cruise Port CEO Stephen Xuereb said a total of 206,437 cruise passengers were welcomed at the terminal from January to July this year, an increase of 8.7% when compared to the same period last year. The revamped tunnel, inviting visitors to discover Valletta, will enhance their experience. The Director of the MCAST Institute of Art and Design, Stephen Vella, said the project’s benefits go beyond its aesthetic appeal. Having students work directly with industry and delivering a project that reaches or exceeds expectations, contributes significantly to their overall long term professional development. MCAST therefore looks forward to furthering its collaboration with the Valletta 2018 Foundation, in the near future.